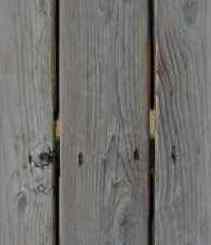 BEST TIME TO VISIT: Summer COMMENTS: The road to Mountain Park is at times barely navigatable. It's best to get there using a four-wheel drive. 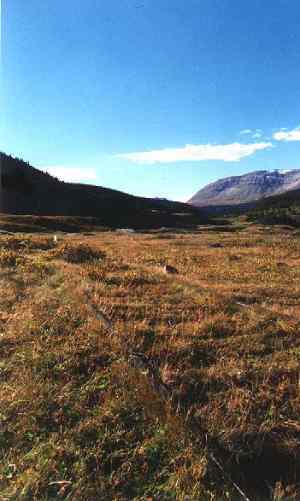 There are no current residents as the town closed in 1950. There are a few foundations and mine structures still remaining. 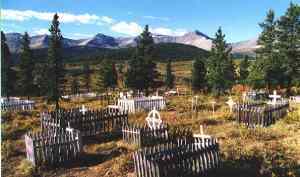 A cemetery, the highest in elevation in Canada, has recently been restored. The mountain scenery is spectacular. 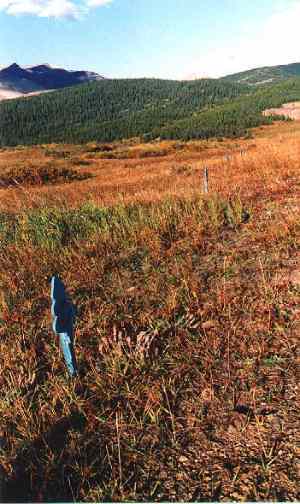 Across the landscape at Mountain Park, scores of simple tree-shaped blue markers have been erected to show visitors where homes and buildings used to be. 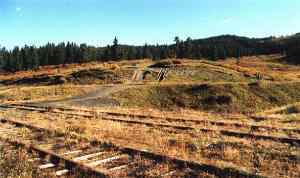 The end of the line of the railway that once came to Mountain Park. 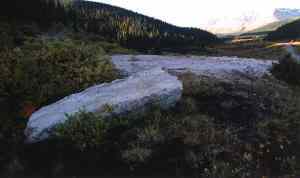 A few foundation ruins can still be found at Mountain Park. The hill in the background, where the historic cemetery lies, overlooks the long-forgotten rail tracks. Mountain Park cemetery at sunrise. 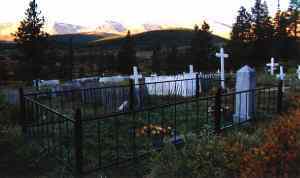 The town's cemetery in the early morning, beautifuly restored two years ago by friends and family members. 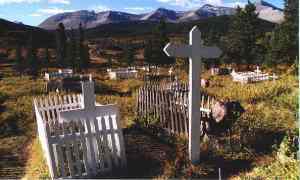 Mountain Park's cemetery was lovingly restored by former residents and family members in 1997. 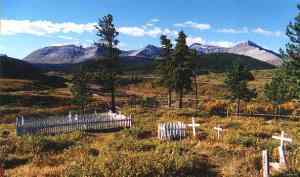 The cemetery overlooks the former townsite and mine operations, which have both long vanished. 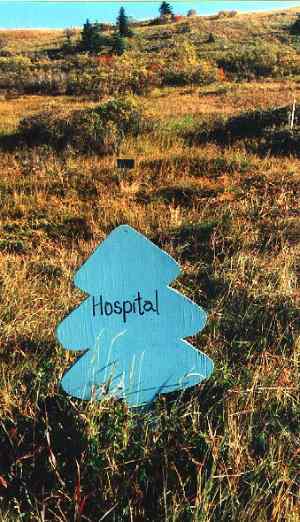 A simple sign on a nearby hillside, denoting where the town's hospital used to be. 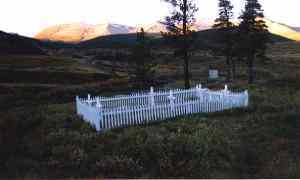 The cemetery, once overgrown with brush, has been restored and burials have been made in the 1990s. 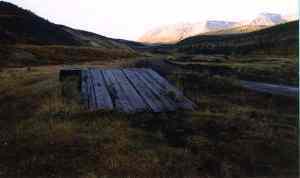 A railway once serviced the town and mine but the station is now long gone, and grass is and mountain weeds are overtaking the remaining tracks. 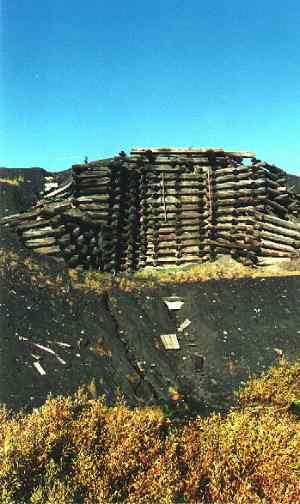 Some mine operation structures at Mountain Park can still be seen by visitors, including this boarded-up mine entrance. A simple cross marks at grave at the town cemetery. 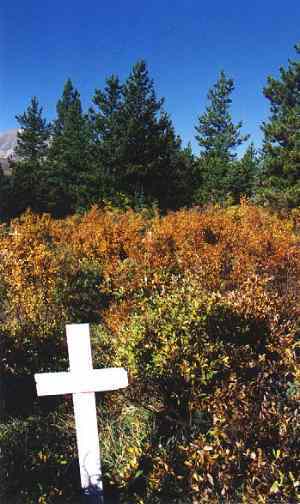 Many graves still lie unmarked in the bush. 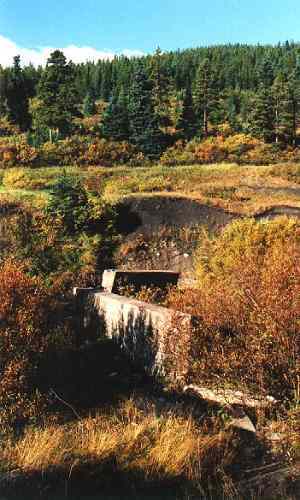 The crumbling foundation of a former mine building at Mountain Park.